The truck certainly stands out. So, if you guessed that the second and last part of my meal was going to be from Baby’s Badass Burgers, you were correct. After the pastel from Bool BBQ whet my appetite, I moved from Brazilian to burgers. 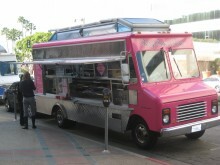 Baby’s actually hit the streets a good while ago with a strong concept: Beautiful women bringing you burgers. 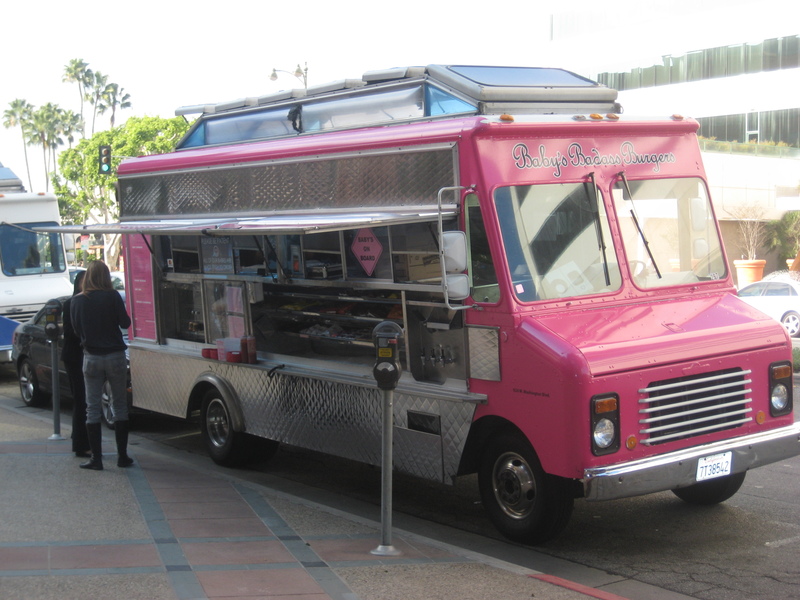 With such a great concept, it is pretty remarkable that this truck has managed to evade the unvegan. Fortunately, this changed when I visited the modern food court at the Miracle Mile. It’s almost like it’s sticking its tongue out at me. It actually took me a little time to figure out what I wanted. The Cougar (aged beef, St. Andre cheese, black truffles) really caught my eye, because both truffles and cougars are fun trends on the rise, but it 9 bucks for two sliders (aka mini burgers). This was a lot to pay, but I knew that all the sliders came in half-pound form as well. Unfortunately, my lovely truck waitress told me that this would cost me 15 bucks. After dropping 4 bucks at Bool, I wasn’t about to make this a $20 lunch. Instead, I went with their Man Eater burger (a half-pounder with smoked cheddar, lettuce, tomato, pickles and the special sauce), which was only 7 greenbacks. As always, I asked for it without the dastardly vegetables. The angelic burger lady didn’t ask how I wanted it cooked, so I crossed my fingers as I waited on the sidewalk for my Man Eater. Brown and juicy isn’t a paradox. After a short wait, my burger was done. I snagged it and took a look. Man, it was big and heavy. Usually burgers are weighed before being cooked, but I wouldn’t have been surprised if someone had told me this weighed a half-pound after cooking. 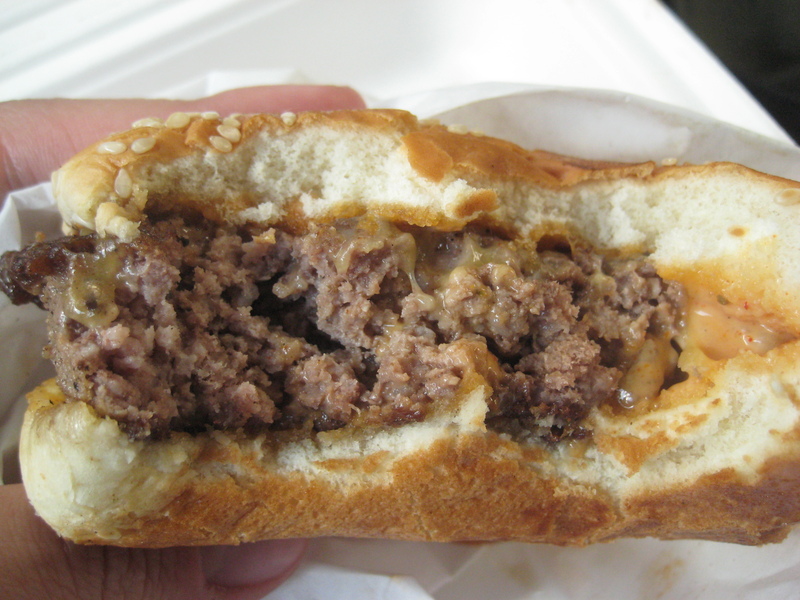 The patty looked like it could have been pre-made because it kind of had hockey puck-like ridges. Still, this Man Eater looked good to me. I started eating and was really happy with what I tasted. The burger was brown all the way through and not the medium that I would have ordered, but in truth, this really didn’t hurt the burger. It was still really juicy and surprisingly flavorful. Even if it had been made from a pre-made patty, the grind was thick and had good texture. 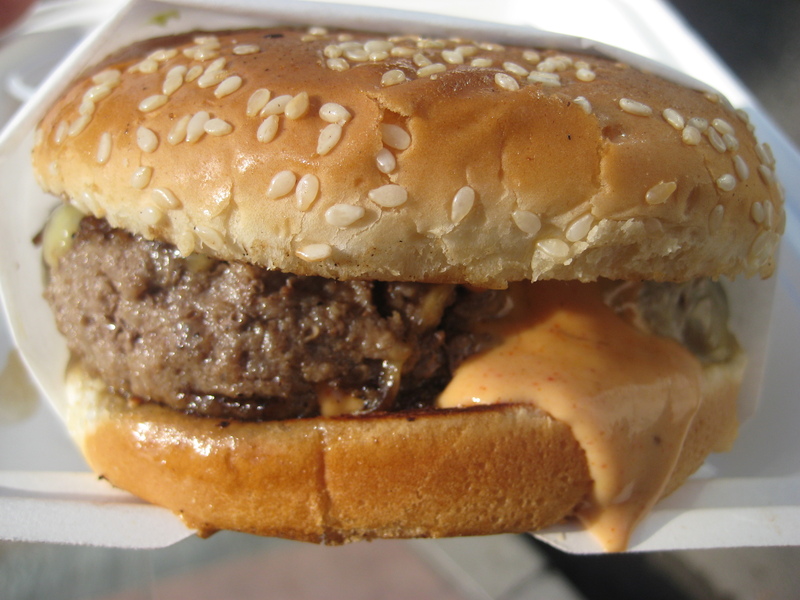 The special sauce was kind of spicy, but not overpowering, and the cheese mixed well with the meat. The bun was just kind of generic, but didn’t get in the way. I was actually surprised by how much I liked this burger since Baby’s seemed mildly gimmicky from the start. At 7 bucks, the Man Eater was a great deal. And now that I know they make a good burger, I’d actually be willing to shell out 15 bucks at dinner time to try out The Cougar.